I want to share with you the kind of art I’ve been making for the past two years. I’ve been away from this blog for a long time, and away from painting on canvas for most of that time, too. So long that I’ve developed an interest in using a new (to me) medium for my work. Now I’m excited to announce my Solo Exhibition coming up in September and I want to track it, and update this blog, and invite you to the show. The exhibition is at the East River Bank at 36 N. 3rd St., just north of Market, September 2-30. The Bank is open Mon-Thur: 9am-4pm, Fri: 9am-7pm, Sat: 9am-1pm. It is great exhibition space, although it doesn’t look much like a gallery from the outside. It is a friendly place, and the ERBank Manager, Catherine Kelly, uses their Old City location to promote Philadelphia artists. Hurray! A Reception is planned for 5-7:15 pm First Friday, September 2nd. There will be refreshments catered by Le Bus and music from the well-known acoustic latin guitarist Magdaliz Roura. In my new work I’ve been removing the surface of cardboard to reveal the corrugated surface, then using that in all kinds of ways to make what I call Bas-relief Cardboards. They’re 3-dimensional, but not what you would call sculpture. I’ve exhibited a few at the Sketch and Plastic Club, but this will be their first dedicated presentation. I think they will show off well as a group – but that’s for you to decide and let me know. 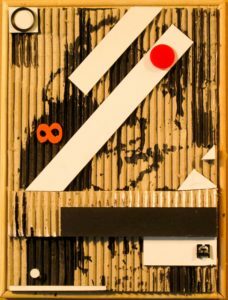 An exhibition of recent Bas-relief Cardboard artwork by Leroy Forney opens at the East River Bank, 36 North 3rd Street through September, with a Reception from 5:00pm to 9:00pm on First Friday, September 2nd, including light refreshments by Le Bus and live music by Magdaliz Roura. Forney’s work creates joyful displays from cardboard, the ubiquitous castoff material common in our everyday lives – highly engineered, utilitarian, disposable – that serve our everyday needs before they enter the dumpster of urban trash. 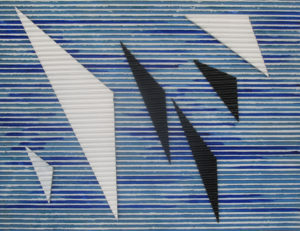 The works are frequently reminiscent of the stripes and colors of Carlos Cruz-Diez and Frank Stella. The Bas-relief Cardboards follow in the tradition of painters like Jean Miro and Robert Rauschenberg and contemporary sculptors, who have used cardboard as the medium for playful designs and conceptual art. 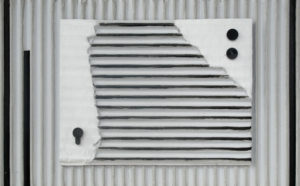 From this starting point, Forney removes the cardboard surface layer to expose the corrugations that form the focus of his work. “This exhibition represents my exploration of ways to create art using this unique surface.” says Forney. Forney is a local award-winning artist who began painting at the Pennsylvania Academy of Fine Art and Fleisher Art Center. He exhibits at the Sketch Club, Plastic Club, and Off the Wall Gallery. The Old City Branch of the East River Bank, in the heart of the Philadelphia Gallery District, serves its local community and supports Philadelphia artists through a program of continuing exhibitions in the lobby.